What exactly is covered in these classes? grades we add other exercises such as the retrieve, long distance stays, send-aways, distance control and scent discrimination. What areas are the classes in? What Type Of Training Methods Are Used? Although we train to competition standards, we will not damage the owner-dog bond for the sake of competition perfection. Our overriding aim is to train your dog to love his work through positive reinforcement. We do not use compulsive techniques or check chains as our standard approach. Compulsive techniques may sometimes be used, but only as a last resort and only under the direct supervision of an instructor and only in particular cases as required for socially unacceptable behaviour (lunging or aggression in the confirmed absence of external triggering cues). Pinch or shock collars are not permitted under any circumstances. Our training is based on real-life scenarios, so we typically do not arrange classes in straight lines - a circle format is most often used, which helps dogs to become used to the distraction of other dogs and people without making them feel uncomfortable Is There A Test At The End Of A Course? At the end of the course gradings are held. Handlers are welcome to repeat a grade and there is no pressure to be graded if the handler does not wish to be graded. Nobody likes to be tested, but the gradings give us all a goal to work towards. Most people achieve their domestic obedience goals whether or not they ace the grading and this is our primary goal - an improvement in your dog’s behaviour at home. Being the dog nerds that we are, we would obviously love to see everybody continue to advanced obedience, but your needs take preference - we’re happiest if your personal goals are achieved! What Is Required For Classes? All dogs must be healthy and up to date on vaccinations, deworming and tick and flea control. The dog should be wearing a normal flat collar and on a webbing lead (approx. 1.2m). Treats and toys are advised. Booking is essential. If your dog hasn't attended one of our puppy schools we'll need to do an assessment first to ensure that our classes can deliver what you're looking for. Puppies that have attended our puppy classes automatically have a slot reserved for them in the next available obedience course. Is There Anything Obedience Classes Can't Address? Most definitely! Before enrolling your dog into any obedience classes please note that there are various components involved. There is the type of "training" that solves behavioural problems and there is the type of training that teaches dogs responses to verbal and physical cues i.e. obedience training. It is possible to have a dog that obeys all his obedience commands perfectly, yet digs craters in the garden and chews up the washing on the line! Obedience training on its own will not solve a behavioural problem. If an instructor tells you this they are either trying to make a quick buck or they do not understand the difference between obedience training and behaviour modification. Resolution of problem behaviour requires in-depth assistance from an experience and qualified animal behaviourist. If you're not sure give us a shout and we'll answer your questions. In keeping with our “real world training” philosophy, we use a variety of training aids to help teach dog and owner how to negotiate obstacles. Pictured above is our famous “Heelworx Golf Course” - a series of stations to be completed with some hazards en route. Real life training for real life! At What Level Is My Dog Considered To Be "Trained"? Well of course you can carry on training your dog indefinitely, but for domestic obedience purposes we suggest completing the Elementary Beginner and then undergoing the three month Canine Good Citizen Bronze course. Where Do We Start? The starting block is Elementary Beginner, which is a 2 - 3 month course offered at all of our branches. Please remember that if you dog did not attend puppy classes with us we will need to do an assessment to ascertain what level of training will best serve your objectives. Plus it’s just really nice to get to know you and your dog before we start classes! How you can help your dog to "get it right"
Please drop us a line if you need any further information - we look forward to hearing from you! Please drop us a line if you have any questions. We look forward to hearing from you! and people without making them feel uncomfortable. What Training Methods Are Used? Although we train to competition standards, we will not damage the owner- dog bond for the sake of competition perfection. Our overriding aim is to train your dog to love his work through positive reinforcement. We do not use compulsive techniques or check chains as our standard approach. Compulsive techniques may sometimes be used, but only as a last resort and only under the direct supervision of an instructor and only in particular cases as required for socially unacceptable behaviour (lunging or aggression in the confirmed absence of external triggering cues). Pinch or shock collars are not permitted under any circumstances. In keeping with our “real world training” philosophy, we use a variety of training aids to help teach dog and owner how to negotiate obstacles. Pictured above is our famous “Heelworx Golf Course” - a series of stations to be completed with some hazards en route. Real life training for real life! Is There A Test At The End Of A Course? At the end of the course gradings are held. Handlers are welcome to repeat a grade and there is no pressure to be graded if the handler does not wish to be graded. Nobody likes to be tested, but the gradings give us all a goal to work towards. Most people achieve their domestic obedience goals whether or not they ace the grading and this is our primary goal - an improvement in your dog’s behaviour at home. Being the dog nerds that we are, we would obviously love to see everybody continue to advanced obedience, but your needs take preference - we’re happiest if your personal goals are achieved! What Is Required For Classes? All dogs must be healthy and up to date on vaccinations, deworming and tick and flea control. The dog should be wearing a normal flat collar and on a webbing lead (approx. 1.2m). Treats and toys are advised. Booking is essential. If your dog hasn't attended one of our puppy schools we'll need to do an assessment first to ensure that our classes can deliver what you're looking for. Puppies that have attended our puppy classes automatically have a slot reserved for them in the next available obedience course. Is There Anything Obedience Classes Can't Address? Most definitely! Before enrolling your dog into any obedience classes please note that there are various components involved. There is the type of "training" that solves behavioural problems and there is the type of training that teaches dogs responses to verbal and physical cues i.e. obedience training. It is possible to have a dog that obeys all his obedience commands perfectly, yet digs craters in the garden and chews up the washing on the line! Obedience training on its own will not solve a behavioural problem. If an instructor tells you this they are either trying to make a quick buck or they do not understand the difference between obedience training and behaviour modification. 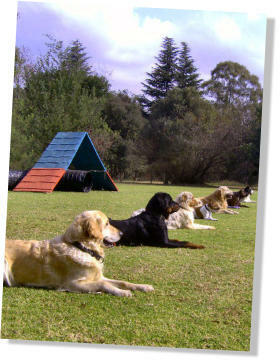 Resolution of problem behaviour requires in-depth assistance from an experience and qualified animal behaviourist. If you're not sure give us a shout and we'll answer your questions. At What Level Is My Dog Considered To Be "Trained"? Well of course you can carry on training your dog indefinitely, but for domestic obedience purposes we suggest completing the Elementary Beginner and then undergoing the three month Canine Good Citizen Bronze course. Where Do We Start? The starting block is Elementary Beginner, which is a 2 - 3 month course offered at all of our branches. Please remember that if you dog did not attend puppy classes with us we will need to do an assessment to ascertain what level of training will best serve your objectives. Plus it’s just really nice to get to know you and your dog before we start classes!